EASTERN Ranges’ and Sandringham Dragons’ wins over Northern Knights and Oakleigh Chargers have resulted in the teams having the most players in the Draft Central Team of the Week for Round 3. Along with Eastern Ranges and Sandringham Dragons having three players each, seven of the remaining 11 sides have two players each in the team, while Bendigo Pioneers, Calder Cannons, Northern Knights and Western Jets have the one player each in the side. Ranges’ captain James Ross will hold down a key defensive spot with Mitch Mellis and Zakery Pretty also making the side this week after impressive performances. Holding down the other key defensive spot is Sandringham’s Josh Worrell, as well as midfielder Finn Maginness and key forward Charlie Dean. Their opponents on the day were Oakleigh who produced the Draft Central Player of the Week in Matt Rowell, while Nick Bryan was the standout ruck across the weekend, with a number of Chargers, such as Will Phillips and Noah Anderson unlucky not to make the side. Northern Knights had a disappointing loss on that day, but Josh D’Intinosante was a shining light in the defeat. 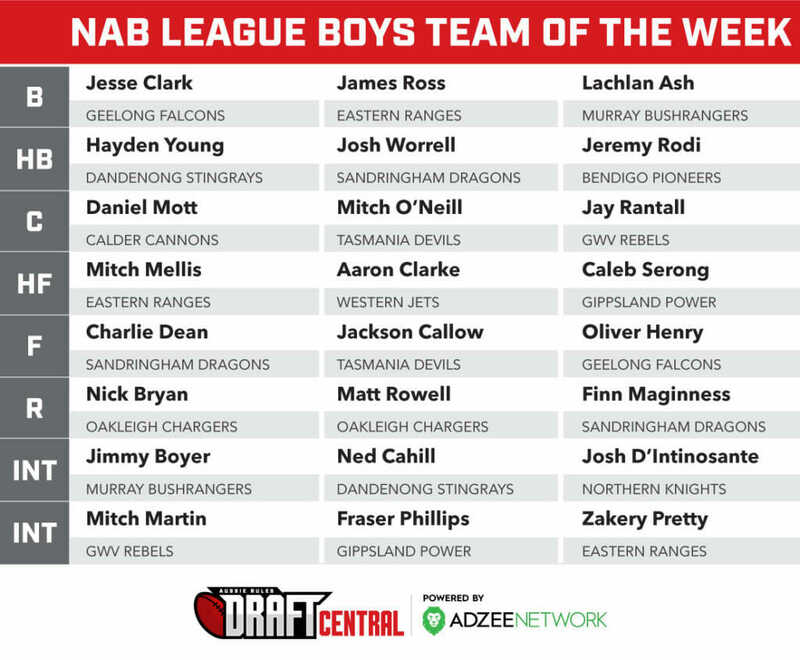 In Bendigo the next day, Gippsland Power’s Caleb Serong and Fraser Phillips combined for five goals and made the Team of the Week, while Jeremy Rodi was Bendigo’s sole representative, though a number of players could have squeezed into the side. In the second game, Dandenong Stingrays’ Hayden Young fits into defence alongside opposition Geelong Falcons’ defender Jesse Clark, while Ned Cahill and Oliver Henry (five goals) also make the team for Dandenong and Geelong respectively. In the final game, Murray Bushrangers’ Lachlan Ash and Greater Western Victoria (GWV) Rebels’ Jay Rantall were superb for their respective sides and slot straight into the starting side, while Jimmy Boyer (Murray) and Mitch Martin (GWV) come off the bench after impressive games. At the Holden Centre, Mitch O’Neill led Tasmania Devils to their inaugural win, joined in the side by key forward, Jackson Callow who booted five goals in the victory. Rounding out the side is the clear standout from each side in the Calder Cannons and Western Jets game, with Aaron Clarke‘s three goals seeing him slot into centre half-forward, while Daniel Mott stands on a wing after his best game of the year. In a week that once again forced some unlucky omissions including Sandringham Dragons’ Jack Mahony, Bendigo Pioneers’ Brodie Kemp and Calder Cannons’ Harrison Minton-Connell who were the last ones just missing out on this week’s side.